AdventureBuddies Blog is for anyone who loves the outdoors, wants to stay healthy and has a little time to read and comment about different interests. We love comments and appreciate the time you spend here. We don’t take advertising, but use links on the right hand side that you can click on to shop REI, Amazon and Sierra Trading Post. When you click on these links, the blog benefits and it costs you nothing. It’s called affiliate marketing. It’s the “yellow pages” of our time. If you bookmark this blog and click thru when you shop, then you’re supporting our efforts to bring you high quality info. 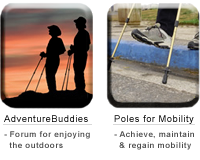 The POLES training website – PolesForMobility.com – focuses on helping people to more safely and completely enjoy their outdoor experiences. Jayah leads hiking, walking and fitness seminars for National and State Park Associations, and other health-related organizations around the country. She has trained users, physical therapists and personal trainers how to use poles to achieve, maintain and even regain mobility for hiking and walking. Jayah is a Sierra Club leader and a breast cancer survivor who founded the Lymphedema Education, Exercise & Prevention Group through California Pacific Medical Center in San Francisco.